224 pages | 3 B/W Illus. Decades of conflict and war have forced millions of men, women and children to flee from their homes and seek refuge in other parts of the country or in foreign lands - Afghanistan is one such country. This book is a study of the displaced Afghan migrant population in India, in particular the persecuted Sikhs and Hindus who are religious minorities in Afghanistan and make up a majority of Afghan migrants in India. It explores the relationship between acculturation and identity development. By focusing on the interactions between the Afghan immigrant population and the Indian society, the author analyses how the community negotiates identity and marginality in a country that does not recognize them as refugees. 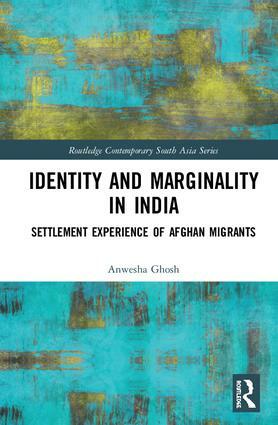 The author explains how the Afghan migrant population manages and negotiates various identities, bestowed upon them by the societies in their home and host countries in their day to day existence in India. An important study of acculturation and adaptation issues of migrant groups in the setting of a developing country, this book will be of interest to academics in the field of refugee and migration studies, ethnography of (ethnic) identity, and Middle East and South Asian Studies. 1. Introduction: Why study the experiences of Afghan ‘Refugees’ in India? Anwesha Ghosh received her doctoral degree from the Willy Brandt School of Public Policy, University of Erfurt, Germany under the DAAD Conflict Studies and Management Programme in 2017. She has published extensively in the field of aid diplomacy, India’s foreign policy, regional cooperation, gender, migration and refugees - all in respect to Afghanistan. Her publications includeAfghanistan from Enduring Freedom to Enduring Chaos: Implications for India (2012), A Leap Forward: Education, Capacity Building and Indo-Afghanistan Co-operation (2014) and Afghan Women in Transition: Yesterday, Today and Tomorrow (2017).